The Hydrogen module allows you to model systems that generate, store, and consume hydrogen. It is ideal for users who model fuel cells, remote off-grid operations, large industrial processes, or any system with hydrogen production, storage, or consumption. This module includes a Hydrogen Load; Reformer, Electrolyzer, and Hydrogen Tank components; and a Hydrogen Fueled generator. To access the Hydrogen Load options, click the Hydrogen button under the Load tab at the top of the page. For details about the Hydrogen page, see the Hydrogen Load section of the help. 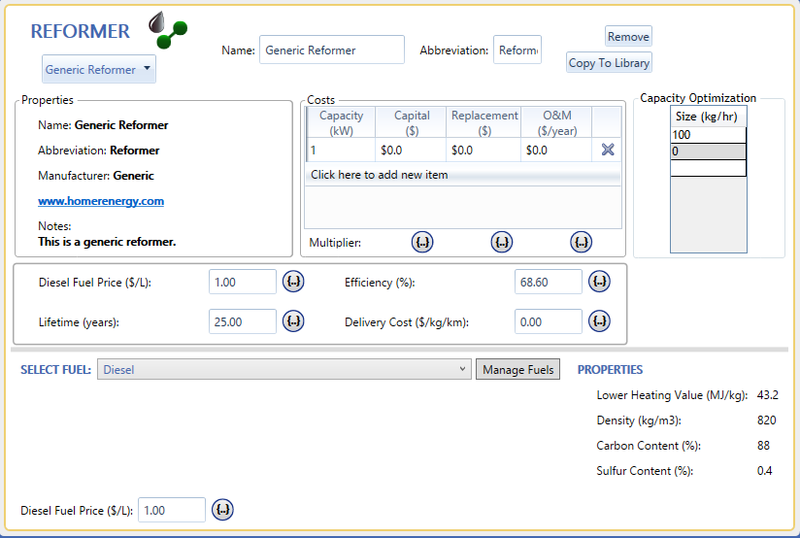 To access the new component options, click the Reformer, Electrolyzer, or Hydrogen Tank buttons under the Components tab at the top of the page. The Reformer component page is shown below. For more information on this component, see the Reformer section of the help. 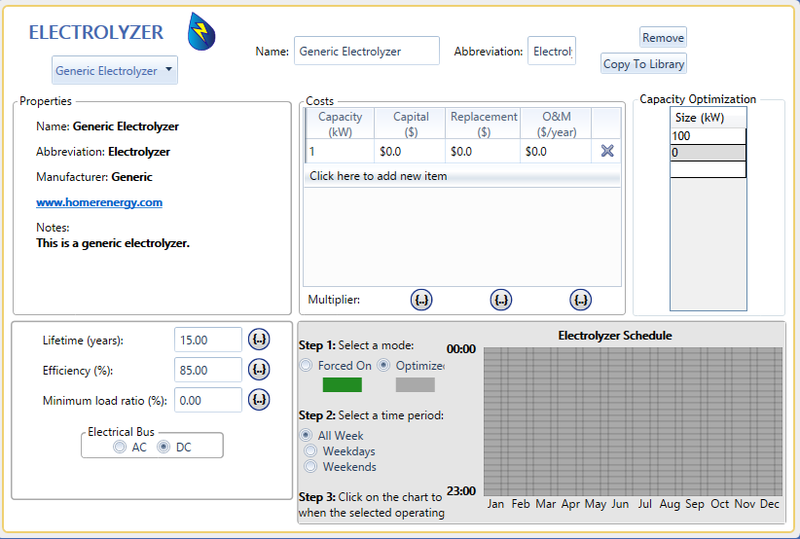 The Electrolyzer component page is shown below. For more information on this component, see the Electrolyzer section of the help. 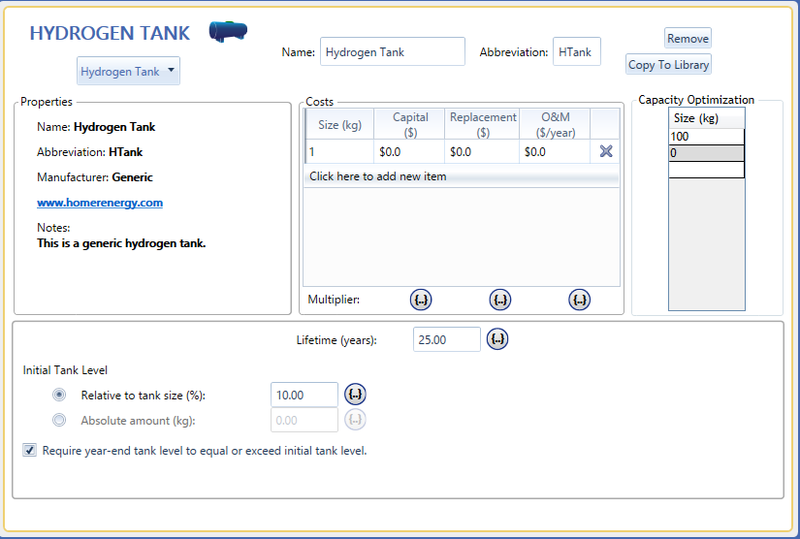 The Hydrogen Tank component page is shown below. For more information on this component, see the Hydrogen Tank section of the help.